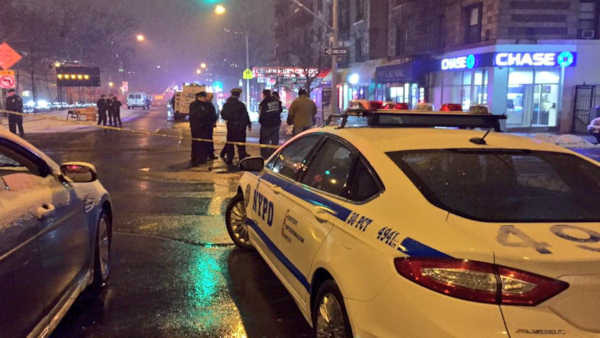 HAMILTON HEIGHTS (WABC) -- Police are searching for a gunman after five people were shot, one fatally, in Manhattan Sunday night. One man was shot and killed near 136th Street and Broadway in Hamilton Heights just after 11 p.m. It apparently stemmed from an argument inside a bar. Police say outside two gunmen opened fire at five of the people involved in the dispute. Detectives have recovered surveillance video that shows two suspects getting out of a car and going up to a man, standing with four other people. The two suspects walk away, and then return and open fire. Twenty-eight-year-old Graham Shadale was shot in the head and pronounced dead at the scene. Two men and two women were also wounded and were taken to area hospitals. Authorities say a 24-year-old man was shot in the right arm and ankle, while a 22-year-old man was wounded in the torso and leg. Both were taken to Harlem Hospital, where they are listed in stable condition. The two women, both 21, were both struck in the shoulder. They were taken to St. Luke's Hospital, where they are listed in stable condition. Shadale has 19 prior arrests, including gang assault, narcotics, loaded firearm and robbery. There are no arrests at this time. The investigation is ongoing.